This Winnebago Adventurer has all the space you need along with complete amenities to keep you comfortable while on the road! This class A gas coach features quadruple slides for added interior space and comfort, a king size bed in the master, plus so much more! 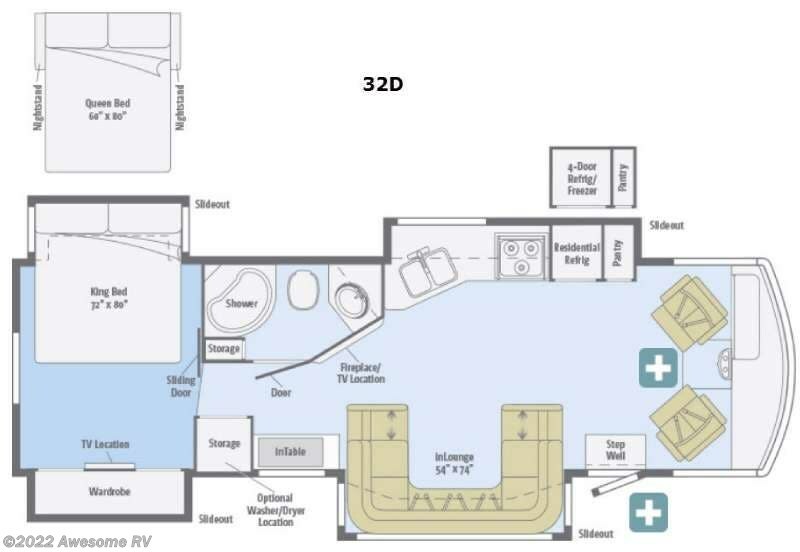 Step inside model 32D and find a wide open living space with combined kitchen up front. There is a U-shaped InLounge with seat belts that makes into a 54" x 74" added sleeping space. A nearby entertainment center with 42" HDTV and fireplace is found along the outer angled bath wall. Straight ahead through the entry door find a slide out kitchen with pantry, residential refrigerator, a three burner range, and angled counter with double sink. There are also plenty of overhead cabinets for dishes and things. Moving back to the rear of this coach find an InTable just beyond the slide out InLounge, along with a storage cabinet that can house a washer and dryer if you choose that option. Opposite the storage cabinet find a full bath with kidney shaped shower, storage cabinet, toilet, and vanity with sink, plus overhead cabinet. A sliding door leads into the rear master that features a spacious layout with dual opposing slides. There is a slide out wardrobe with a location for a TV on your left, and there is a slide out king size bed on the right. You can choose a queen bed with nightstands if you wish instead that would also slide out providing added room inside. All this and more can create smooth travels for your family. You can also choose a 4-door refrigerator/freezer instead of the standard if you wish, plus so much more! Check out Stock # 45115KB - 2016 Winnebago Adventurer 32D on winnebagorvsource.com!